Family's a weird thing. I realize that telling other people your dreams is a pointless endeavor--nothing makes sense because the narrative structure isn't there--its emotional power is only evident to the person telling it. Still, this is my blog and I do what I want. Last night I had a dream. There was a flood, wild and domestic animals escaping from said flood, and I was paying my dad a visit. As we were trying to escape encroaching water, my dad insisted we take my (still-alive) grandpa's freshly cut gravestone to him so he could read it. I argued. Eventually I read the gravestone and realized that my grandpa was not still alive. The needle dropped and suddenly there was a dramatic soundtrack to my dream and the words on the gravestone matched the lyrics in the song. I broke down crying. Then my husband woke me up. I was still crying. Real, physical tears. I don't think that's happened since I was a little kid. In actuality, my grandpa died almost a year ago. And, in real life, I paid my dad a visit almost a month ago. While I was there we saw my grandpa's grave. The song was a discombobulated version of a pre-release from Josh Ritter's new album that I've had stuck in my head for several days. I know where all the pieces came from and, in my real, awake life, I understand that, under the surface, I've been thinking a lot about family and how things just don't really seem to work out, how it's both easier and harder for me to be a long way away. In the third season episode, "Real Life," The Doctor decides he ought to experience the same crap I've been dealing with but he's not very good at setting it all up. 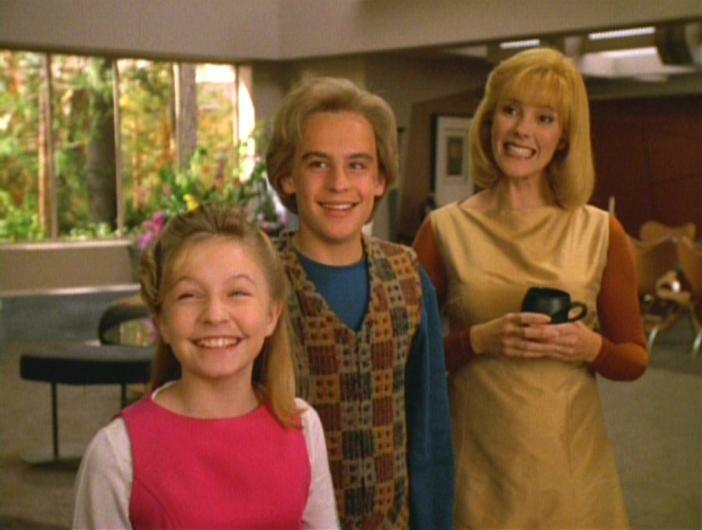 He creates a holodeck family for himself but it's all very Leave It To Beaver and everyone is delightful, intelligent, and articulate--and of course they all revere him. When B'Elanna and Kes come over for dinner they immediately point out how rosy everything is and B'Elanna offers to make his program more realistic. Now The Doctor's wife is a busy professional who doesn't have time to cater to his every whim. His daughter is a high-achieving but temperamental all-star and his teenage son is way into some dangerous Klingon stuff. Now The Doctor's family life is full of spats and shouting and accusations etc but then his daughter breaks her noggin playing Pereses Squares and The Doctor leaves the program behind at the moment when they need him most. I get this. The way I'm wired, I have a tendency to shove anything that's too emotional into its own tidy place (sometimes this is that place) until it's stale enough that I can deal with it (which is maybe never.) Family stress is hard to logic away. It's hard to quit your family and I don't want to even if I could. But I also can't go around dwelling on it and/or not dwelling on it. Eventually I have to have those emotions I don't want to have and sometimes they get shoved into my dreams because dealing with this stuff is just part of life. That's what The Doctor learns too. After trying to forget about his experimental family and all of their holo-problems, he realizes (with help from Tom Paris) that this is all just part of life and if he tries to push those emotions away, he'll never really deal with them so he goes back and faces the death of his holo-daughter alongside his family. The needle drops. There's a dramatic soundtrack. Everyone cries.